2015 FORD MUSTANG DEBUT – YOU WON’T MISS YOUR INHIBITIONS ONE BIT. This is not technology for technology’s sake. Every feature Mustang offers enhances your driving experience – whether it’s the advanced sensors that detect cars in your blind spots or the advanced communications system. SOMETHING THE WORLD CAN AGREE ON. There’s a 3.7-liter V6. And the available 5.0-liter V8 will benefit from increased power this year. But the real news is how we’ve paired Mustang performance with the EcoBoost® engine. The thrill you get behind the wheel of a Mustang is a given. But now you can thank a fully independent rear suspension for that rush. This design change not only improves body roll but also isolates road imperfections for a better feel. Content © 2011 AOL Inc. Autoblog is a trademark of AOL Inc. Used with permission. Between a bevy of spy shots, speculative renders and insidery images from the halls of Car and Driver, we’ve got a pretty decent idea of what 2015 Ford Mustang might look like. Still, we’re excited to see the real deal as soon as possible. Mustang fans: Your long wait is almost over. The sixth-generation of Ford’s iconic pony car — the first affordable sports car for the everyman — will be introduced to the world Dec. 5, just a few months short of its 50th birthday. 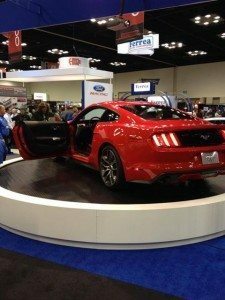 It seemed more than a little strange when the refreshed 2014 Chevrolet Camaro SS debuted on the daytime talk show Live with Kelly and Michael back in March but not to be outdone by its rival – 2015 Ford Mustang will also feature a prominent television spot on the day of the debut. As we’ve already told you, Ford will use ABC’s Good Morning America talk show to introduce the 2015 Mustang in New York, while the European unveiling in Barcelona will broadcast via a “Go Further” event. Ford will unveil the 2015 Mustang, the next generation of the iconic pony car, on Dec. 5. The unveiling will be held simultaneously in Dearborn; Los Angeles; New York; Barcelona, Spain; Sydney, Australia, and Shanghai, China.